I don’t commit easily… One very good example is the mental torture I submit myself and others when I read a menu at the restaurant! It’s so hard for me to pick a single dish; to me, it feels like a medley of all the options would be such a preferable alternative. Usually, once I have lobbied for everyone’s choices & secured the right to taste from every dishes; I will refuse to return the menu to the waiter and continue to study it closely in order to get inspiration for another day! 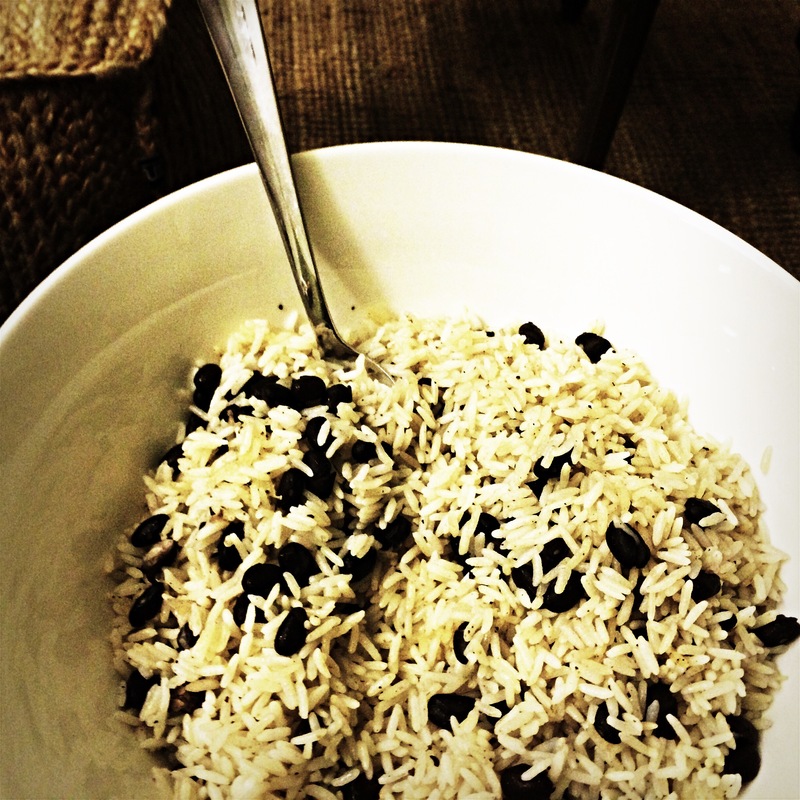 I admit it: When it comes to food, I micromanage! I simply can’t commit and make a choice that will be final and lock me into … gasp… certainty! Hate away, ’cause I’m that polite, yet, annoying person at the restaurant; who also happens to be a notoriously picky eater; so be warned if you ever want to have dinner with me; I will scrutinize the menu, ask 20 questions and check the alternatives & substitution if not satisfied with what’s on offer! On the upside though; if a dish hits the spot; I will be giving it the credit it deserves and recommend it to everyone I meet for many moons to come! With this preamble, I guess it is no surprise that my favorite types of dinner are the one that give me the opportunity to mix and match and combine flavors to my preferences! 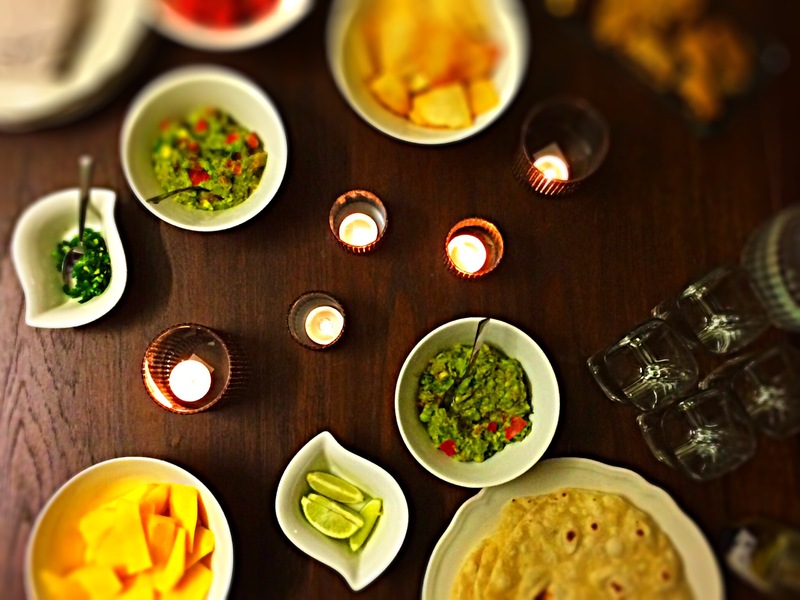 This brings us to Danielle’s delicious & nonchalant Mexican finger-food dinner. Even though her day didn’t turn out as planned, she still succeeded in pulling together this incredible feast at the drop of a hat! 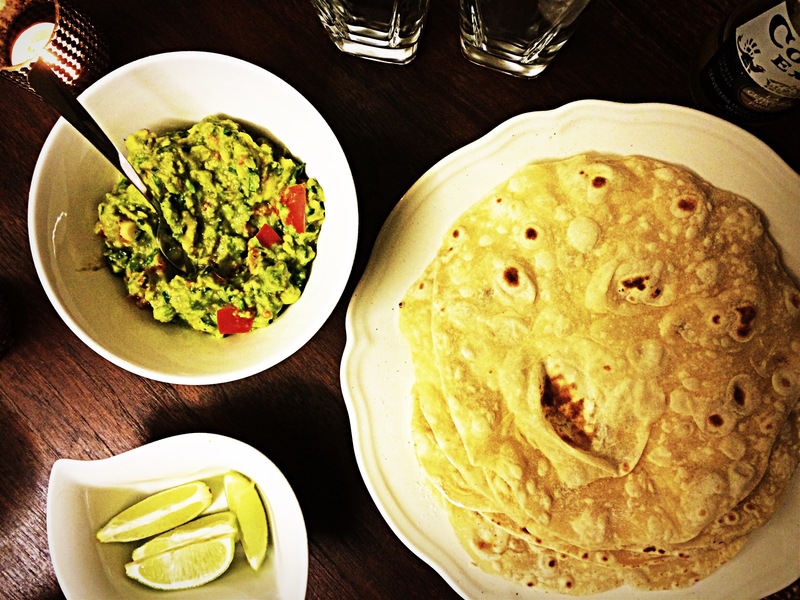 The Soft flour tortilla are made using regular flour, and a ratio of 1/2 a cup of oil for 1 cup of oil. Combine all the ingredients* and mix until a soft dough is formed. Then leave to rest for 15 minutes. The dough should come together nicely and bounces when poked. Once rested, separate the dough to ping-pong sized bits and roll them until paper thin. Get a pan very hot, (no need to add oil) and add each circle of dough one by one turning them once to cook on both side. Be careful; they are so thin so they cook within a few seconds so keep an eye on them as you roll the next one as they can burn easily. As soon as you see the bubbles form, turn it around. Once cooked, pile them onto a plate and let cool slightly. If kept in an air tight container, they are still good for a few days and can be warmed for some more delicious lunches! 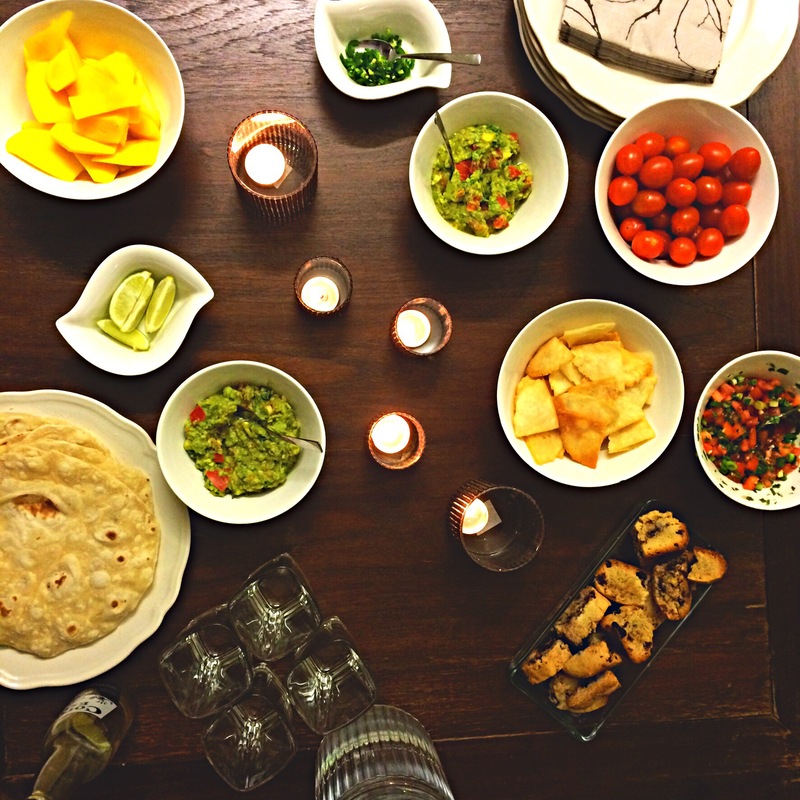 Fresh slices of Mango, Jalapeno, guacamole, soft tortilla wraps & wedges of lime to go with the Mexican beers! What could be better? The table is full of possibilities for flavor combinations, the vegetables are colorful & fresh, the corn tortilla chips are warm, crisp & pleasantly salty. I add extra jalapeno on everything and wash the burn with ice cold beer! The leftover tomatoes ended cubed, with a handful of sliced red & green onion, thinly cut coriander; jalepeño, olive oil and the juice of half a lemon. The Corn Tortilla chips are made using cornmeal* – , water and this gorgeous “Hecho en Mexico” press to get them to even thickness. The advantage of the press is that they all fry at the same speed. But if you don’t have it, use a regular rolling pin with plastic on top of the dough. Cut the chips in triangle shapes and throw in hot oil to fry for a few minutes. sprinkle with sea salt and enjoy while still hot, dipping generously in guacamole! Finally, though we didn’t get a chance to try it, I was dreaming of a Margarita, so until next time & the secret recipe is uncovered; I’ll continue to rely on this one! *Masa Harina, Corn Meal (or Maissijauho) – is a flour made of corn, it is used for corn tortilla. It’s not to be confused with corn starch like Maizena that is used to thicken a sauce or with polenta (maissiryyni). In Helsinki you can find it in Ruohonjuuri . Next Post Lost in the Middle of Nowhere!